My favorite size block is 12″ finished. You can put as many or few pieces into it that you like and get a quilt quickly. I prefer a 6 inch block!! I haven’t found one yet that I don’t like, but the 2″ are fun to make. Hello, I like a 6 inch block because it is versatile. It can produce a baby quilt easily all the way up to large sized quilts. Because I don’t through any scraps or bits of fabric away, saving 2 1/2 inch strips/blocks is easy, and then they can be used to create 6 inch blocks easily. 6” to 12” – I love to mix and match scraps in a variety of blocks. Somehow it all magically comes together in the end. I don’t think I have a favorite block size. Most of the blocks I have made have been 12″, but I have a 6″ block in mind for another quilt. Right now I am doing an EPP queen sized quilt using 2″ 6 pointed stars and 2″ hexies. I really like 8 x 8 blocks. I’m not sure why, I think because most of the quilts I have made use this size. I like a finished 6″ block. I would love to win the 2nd Splended book as I have the 1st one already. Six inch finished blocks are my favorite, but I’ve never seen a block size that I didn’t like! Most of my quilts are 12 inch blocks but my latest wall hanging is 6 inch blocks. My Splendid Sampler 1 is also the smaller blocks. I am also working on a hexagon quilt. So I guess I don’t have a favorite. If the pattern calls my name then that is my favorite at the time. Thank you for the giveaway. I like 12 inch blocks they seem to cover the ground quicker. I am a beginner in piecing quilt blocks. I have already done 5 piecing quilts. I am so proud of my quilts. The sizes vary from 1″ to 12″ blocks. I am eager to do more piecing blocks/quilts and new tips. I’ve been working with 18 and 24 inch blocks lately. Big blocks mean a faster quilt! I am a new quilter and have made only a couple different sizes of blocks, so I don’t really have a favorite size. Love your Big Sun block! I really enjoy mixing 6″ and 12″ blocks in a quilt-sew many possibilities! I don’t have a favourite size, but like working with blocks divisible by 2 as you can mix and match within a quilt for a varied look. Thanks for the fun block and being so generous. Before the Splendid Sampler I would have preferred an 8” block. But I have made so many 6” blocks this year that it is also a clear favorite! As an intermediate Quilter, I have not preferred the trend towards 12”, 16”, 18” plus Blocks because I like the challenge of complex piecing on a smaller scale. My favorites are samplers and scrappy quilts. I enjoy the challenge of shopping for & choosing my own fabrics/colors and perhaps making multiples of the same block in different color ways! I do like the Moda 5”, 10”, jelly rolls etc precuts because these give me a great coordinated variety to choose from. I am currently teaching a weekly quilting class in my over 50 retirement community. I’m concurrently making 3 Samples & demos each week for this class and many of our quilts are donated. This past year alone our group has donated 17 quilts to Hurricane Harvey victims who lost everything; about 15 quilts for Vets, and several quilts for Abused children in Africa. I make all sizes but a fav would be 6-8 inches. I belong to several block exchanges and this size seams to work the best. 12 inch but I have enjoyed the 6” blocks for the SS2. Thanks. I tend to either want to make giant one block quilts or smallish 6 x 6 inch block quilts. It all depends on how I am feeling, what the quilt is for, what I can pull from my stash, the amount of time I have to do it in, and probably most important–my mood. I like both 6″ and 8″ blocks. Both of the Splendid Samplers have been such fun, especially to see each maker’s version of each block. It’s always so amazing how unique each one looks. Thank you, Lissa, for this fun block! I am really loving the 6″ block. I can’t wait to get started on this sew along for the Splendid Sampler Book2. I have the book and have made some of the blocks. I had a lot of fun doing those. I like the small 6″ block. It’s the easiest th work with for me. Thank you for the chance to win some goodies! I prefer 8” or larger. I am definitely finding I am in need of a lot of practice doing the 6” squares. One 6” square takes as long as three larger blocks. Hopefully after 00 blocks in the SS2 I’ll have it mastered. I seem to like the 9.5 x 9.5 block. It is just right for the different aspects of the block to be a good size to work with. I look forward to working with your block and the others. The different size will give me a chance to try something new. I really like the 6″ blocks from the Splendid Sampler. But have been known to make blocks of other sizes. I have come to like the 6 1/2″ block.. It kept me interested because i was able to complete them fairly quickly. If it had been a bigger, longer, more complicated process, i might not have been able to complete all the blocks on the first Splendid Sampler. I love 6 inch blocks the most I think, but 12 inch blocks that can be made with 2, 3, 4, or 6 inch block combinations are also great. Small blocks are my favorite, 3″, 4″, and 6″. My favorite size block is 12″. I like 8″ or 12″ blocks. Because I consider myself a toddler in quilting, bigger is easier. I like 6″ and 12″ blocks the best. Thank you for the giveaway. Hope I win, but if I don’t congratulations to whoever wins! OK, as my girls always said Mom you are just a little weird. I prefer 9″ blocks, they are not too big or not too small to work with, they are just right! This way I feel like I have more variety in my placement of my blocks. My favorite size block is 12.5 “. The larger size is usually easier to piece and a quilt top comes together rather quickly! 8 or 12″ blocks would probably be my choice, but I’ve seen some really nice designs with smaller blocks. I don’t really have a favorite size for my blocks I just love quilting blocks of any size. It’s the fabric or the design that I fall in love with then I choose not the size. My favorite size block right now is the 12″. I currently am in charge of our block lotto for our guild, and every month I’ve chosen a pattern that is 12″. The ladies seem to like this size, and we’re also asking them to make the same block in red, white and blue for a QOV quilt. Some ladies actually bring in 4 or 5 blocks for the QOV quilts! Maybe when we’re done doing QOV quilts I’ll change the size of the blocks, but for now I’m sticking with 12″ because it works best for the QOV blocks. Thanks so much for the chance to win!! I am so new at this craft. I have sewn most of my life, my mother taught me. Only tried quilts a few years ago, loving it. It’s the only sewing I do. I have an embroidery machine and digitizing software, if I can digitize it, I will. Am learning that way too. I don’t have a favorite size block. I enjoy making traditional blocks with a new twist. Thanks for the book and fabric giveaway. I used to like 12 inch blocks, because I didn’t need too many to get a good sized quilt top. Now I love all sizes – I’ve been doing more with 6 inch and less lately. 6 or 8 inches, I think. I love the palettes used for both books! I really like the look of an 8″ block – although when I first started piecing, I felt like the bigger, the better! I don’t really have a favorite size. My Baltimore album quilt has 16″ blocks and they were fun to applique. 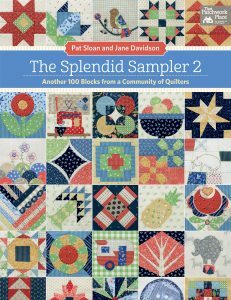 But I am also enjoying the 6″ Splendid Sampler blocks .